Perfect location, and really friendly staff. Room was great and the bed was super comfy. I liked the laundry facility. The pool was being relived so we used the pool in the next hotel . The pool area looked nice but we didn't get to use it. Great location, nice clean room with everything you need, balcony overlooked both the ocean & the street, nice pool on-site. The room was spacious and spotlessly clean. Well equipped and a bonus having two bathrooms! Perfect location - beach is just steps from the front entrance! Nice to have a room with a separate sitting area. Free wifi connection was strong. Very happy with our stay! The pool & barbecue faculties are awesome. Rooms clean & spacious. We had view of beach with great balcony would totally recommend rather than view of pool area. Comfy bed & nice bathroom. Location was excellent, staff were very friendly,room was clean and large and well equipped w it’s everything you would need. We had ocean view room, worth the extra money. Didn’t want to leave. The owner was lovely. Very welcoming. It was raining so unfortunately did not walk around. Plus we had just driven from Brisbane and were exhausted. I would definitely go back. The apartment was lovely and very comfortable. It is right across from the beach area with the stinger nets and lifeguard. Our room actually had 2 bedrooms, a spacious bathroom and a large covered patio overlooking the pool area. The area is very quiet, not much traffic and the most noise -and we enjoyed it- was from the cockatoos. Super location ,friendly,helpful staff. Close to public transportation. Super relaxing areas. On site tour booking for excursions. With front door pick up and return. Lock in a great price for Paradise On The Beach Resort – rated 9.2 by recent guests! Paradise On The Beach Resort This rating is a reflection of how the property compares to the industry standard when it comes to price, facilities and services available. It's based on a self-evaluation by the property. Use this rating to help choose your stay! 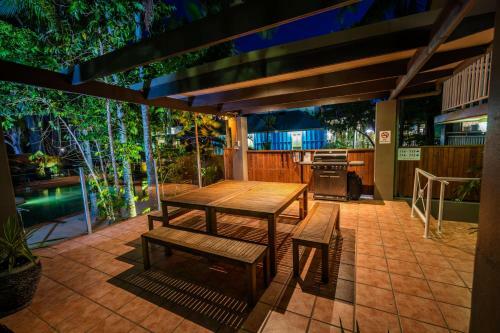 The tropical north's "best-kept secret", Paradise On The Beach is on the beachfront in the heart of Palm Cove, among lush tropical palms and giant ancient melaleuca trees. Paradise is a boutique resort of 34 studio and 1 bedroom suites. All rooms have fabulous designer décor, plasma televisions/DVD's, microwaves and full bathrooms. All have shady balconies overlooking the pool and gardens. Paradise On The Beach Resort offers great value for luxury accommodations. When would you like to stay at Paradise On The Beach Resort? This studio apartment features a balcony with a day bed and pool views. It has a stylish bathroom. This studio overlooks Palm Cove Beach. It has a balcony, a day bed and a stylish bathroom. This spacious apartment features a balcony with a day bed and pool views. It has a separate dining area, kitchenette and a stylish bathroom. Please note that rates are based on 2 guest. Maximum occupancy is 4 (see Hotel Policies). This apartment overlooks Palm Cove Beach and features a balcony and a day bed. The bathroom has a spa tub, and there is separate entertainment and dining areas. This suite features a spacious balcony with a day bed, overlooking the resort pool and hot tub. It also includes a separate dining area and a kitchenette. Please note that rates are based on 4 guests. Maximum occupancy is 6 (see Hotel Policies). House Rules Paradise On The Beach Resort takes special requests – add in the next step! Paradise On The Beach Resort accepts these cards and reserves the right to temporarily hold an amount prior to arrival. Please note the pool at the property will be closed from 29 January to 28 February, 2019 due to renovations. Please note that parking is limited and subject to availability. It is allocated on a 'first come first serve' basis. Please note that 7 days prior to your arrival, one nights accommodations will be charged to the credit card provided. I missed not having a kitchen sink in the unit. This impacted on my ability to wake in the morning and have a cup of tea, while my husband slept. I do not feel that I can get water from the same room as my toilet! The hotel has no curb appeal. You walk through a travel office to get to the reception. So initially your hoping you didn't make a mistake. However, the rooms are nice, staff is helpful and it's convenient to restaurants and shops. 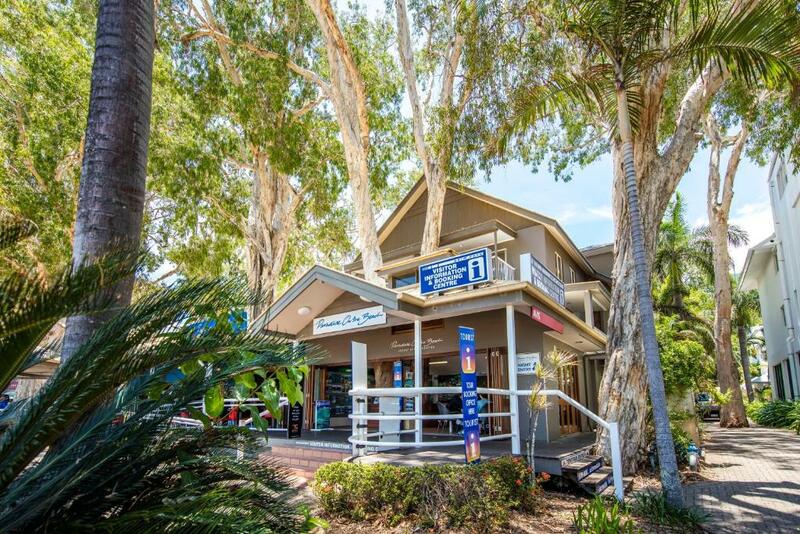 Clean, BBQ facilities, coffee shop close by, friendly staff, aircons in rooms. Great location. Beautiful view. Comfortable bed. Loved the spa. The pool area is lovely. Not having a sink in the kitchen. We liked a daily room service as well. Rooms need to have brooms in them. Great location, clean spacious rooms, excellent service, value for money. No hotel nearby so maybe a minbar....just a small thing. It was quite noisy at times with slamming doors, (maybe the door closing mechanisms don't work well) cleaners' activity and loud conversations could be heard in the stairwells near our room. In the studio the bathroom is too small. Comfy bed, nice balcony, central location to cafes and restaurants as well as the beach. Off street free undercover parking. Big strong umbrellas to use when it was raining. Friendliness of staff. Location. Relaxed atmosphere. Room layout. Everything really.